A lightweight packable windbreaker jacket that folds nicely into it's own pocket. A great jacket to wear when cycling the trails in cold or damp conditions, but easily packable when things start to warm up. 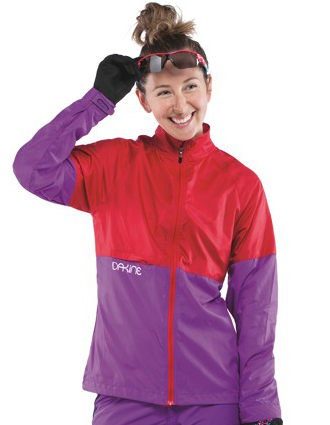 Dakine Women's Breaker Jacket is rated 3.0 out of 5 by 2. Rated 1 out of 5 by rkexC2 from There's a bargain and then there's cheap tat! I was really disappointed when I received this jacket - it not only looks cheap, it feels cheap. I can only say that I'm not surprised it was offered at half price, suffice to say I am returning it.